The global business environment has weakened, due to a number of factors such as low commodity prices, weak trade growth and financial turbulence. Still, Asia remains a global leader, with emerging Asia contributing more to global GDP growth than other regions. The fragility of the global economy, as well as the above mentioned risks, may weigh on Taiwan’s economic recovery. For this reason, political institutions in the country are working to reshape the country’s global competitiveness, and create a vigorous and sustainable economy in Taiwan. Against this background, businesses in Taiwan appear to be strongly focused on credit risk management, in order to protect their liquidity position against the risk of payment default arising from B2B trade on credit with both domestic and foreign customers. Survey findings in Taiwan confirm this, and businesses’ concern about efficiency in receivables management as the greatest challenges to business profitability this year. Demonstrating a real preference for the safety of cash based transactions, suppliers surveyed in Taiwan made 39.5% (down from 49% last year) of their B2B sales on credit terms. This falls below the average for Asia Pacific, where 46% of suppliers sold on credit. This quite strong aversion to selling on credit terms, which Taiwanese suppliers appear to have in common with those in China, may point to a payment culture that prioritizes payment methods that minimize the exposure to the risk of payment default. 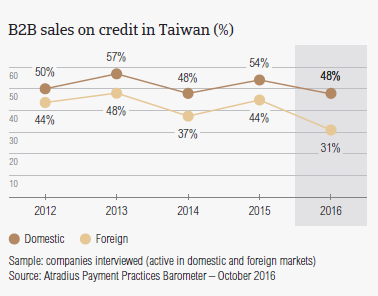 Along with this conservative attitude towards granting trade credit to B2B customers, suppliers surveyed in Taiwan appear to be markedly more inclined to offer credit terms in their home market than abroad. Nearly 48% of domestic and 31% of foreign B2B sales in Taiwan were transacted on credit. This compares to 50.3% of domestic and 42% of foreign credit based sales at regional level. The foreign figure for the country is notably below the average for the region, showing that suppliers in Taiwan are the least open to export on credit terms in Asia Pacific. This preference of suppliers in Taiwan for selling on credit in the more familiar territory of the home market (also observed in China) may highlight that the security of the transaction, as well as the familiarity with domestic business practices, are of primary concern for trading companies. 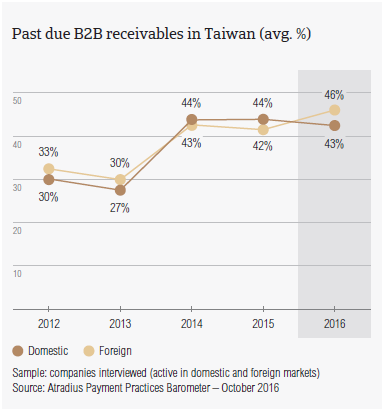 91% of respondents in Taiwan (88% at regional level) reported late payment of invoices by domestic and foreign B2B customers over the past year. This response rate, which is equal to that in China, resulted in an average of 44% of the total value of B2B receivables remaining unpaid after the due date. This is in line with the Asia Pacific average (44%). 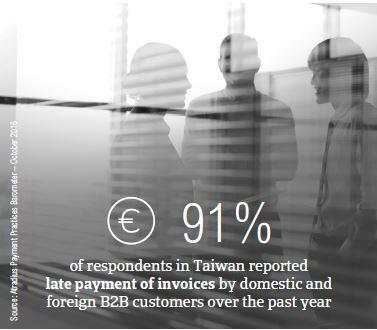 On average, 43% of the total value of domestic B2B invoices in Taiwan was paid late. The proportion of foreign B2B invoices paid late was a little higher, amounting to nearly 46% of the total value of Taiwanese suppliers’ export sales on credit. Compared to last year, the domestic payment default rate in Taiwan remained steady. In contrast, the default rate of foreign invoices increased by an average of 4%, which is the highest y-o-y increase at regional level. This may explain the very conservative approach to granting trade credit to overseas customers shown by suppliers in Taiwan. Late payment of (domestic and foreign) B2B invoices in Taiwan is reflected in the average Days Sales Outstanding (DSO) figure of survey respondents. In Taiwan, this averages 42 days (in line with the 41 days average for the region) and shows no significant variation compared to one year ago. This may indicate Taiwanese suppliers’ strong focus on collecting long outstanding invoices of high value. 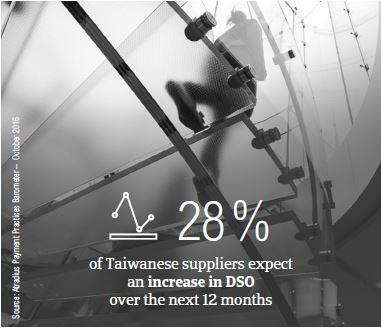 About the same percentage of Taiwanese suppliers expect an increase in DSO over the next 12 months (28%) as an improvement (26%). 46% of suppliers surveyed in the country do not anticipate changes in DSO over the same time frame. Most of the suppliers surveyed in Taiwan (around 24%, compared to 21% at regional level) consider cost containment to be the biggest challenge to business profitability this year. This opinion appears to be consistent with Taiwanese suppliers’ strong focus on the efficient collection of outstanding invoices, as a way to contain the financial and administrative costs of carrying outstanding trade receivables. Maintaining adequate cash flow levels concerns as many suppliers in Taiwan as in Asia Pacific (20%). Slightly more respondents in the country (14%) than in Asia Pacific (11%) consider efficiency in receivables management to be the biggest challenge to business profitability this year. 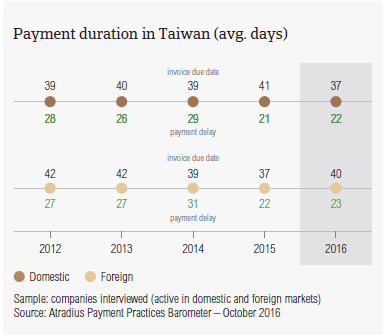 In Taiwan, suppliers request payment of domestic B2B invoices, on average, 37 days after the invoice date (average for Asia Pacific: 32 days). Foreign customers an average of 40 days to pay. Over the past year, Taiwanese suppliers have shortened the average payment terms offered to domestic B2B customers by an average of five days. This stricter credit policy applied by Taiwanese suppliers domestically may reflect downside risks that currently weigh on Taiwan’s economic recovery. In contrast, foreign terms have lengthened by an average of three days, which may indicate an attempt of suppliers to win sales contracts overseas. Both foreign and domestic B2B customers of Taiwanese suppliers settle past due invoices almost within the same time frame as they did last year (on average, 22 days after the invoice due date). This means that suppliers in Taiwan turn overdue invoices into cash, on average, around two months from invoicing. This is in line with the Asia Pacific average. Significantly more suppliers in Taiwan (nearly 56%) than in Asia Pacific (46%) reported that domestic B2B customers pay invoices late due to insufficient availability of funds. One year ago, the response rate for Taiwan was 46%, suggesting that companies in the country are operating in a challenging business environment. In contrast to the survey pattern, which highlights that domestic customers in Asia Pacific delay payments intentionally for financial purposes, more suppliers in Taiwan (35%) than in Asia Pacific (25%) reported that domestic customers delay payment most often due to disputes over the quality of goods delivered or services provided. This is the highest response rate for this reason observed across the countries surveyed in the region, which indicates that this issue occurs on Taiwan’s domestic market more often than elsewhere in the region. In line with the opinion expressed by most of the suppliers surveyed in Asia Pacific, the most frequent issue affecting credit based transactions between Taiwanese suppliers and their overseas customers is the complexity of the payment procedure. This was cited by 43% of suppliers in the country (38% at regional level). Customers’ liquidity issues delay payment of export invoices for 37% of suppliers in Taiwan compared to 34% in Asia Pacific. 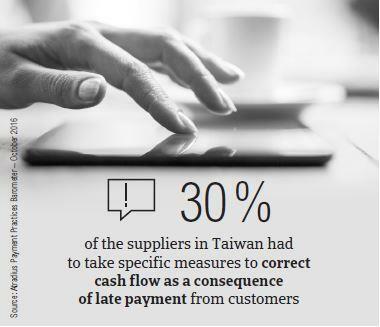 Most of the suppliers in Taiwan (30%, compared to 34% in Asia Pacific) had to take specific measures to correct cash flow as a consequence of late payment from customers. Almost as many suppliers in the country (22%) as in Asia Pacific (24%) pursued additional financing from banks, factors or others. However, 31% of suppliers in Taiwan (compared to 25% in the region) reported that late payment from customers had no significant impact on their businesses. This is consistent with the earlier mentioned finding highlighting that more respondents in the country (14%) than in Asia Pacific (11%) consider efficient receivables management to be the greatest challenge to business profitability this year. To ensure the utmost efficiency in B2B receivables management, notably more suppliers in Taiwan (54%) than in Asia Pacific (44%) will check their customers’ payment history more often over the next 12 months. 50% of suppliers in the country (45% in the region) said they will increase customers’ creditworthiness checks over the same time frame. 48% of Taiwanese suppliers (39% in Asia Pacific) will sell more often on cash terms to B2B customers. This tallies with Taiwanese suppliers’ clear-cut preference for cash based transactions commented earlier on in this report. 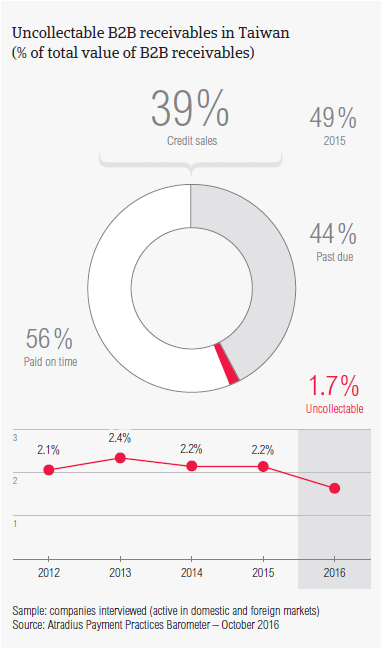 Suppliers in Taiwan wrote off 1.7% of the total value of B2B receivables (down from 2.2% last year) as uncollectable. This is below the average for Asia Pacific (2.1%). It is consistent with Taiwanese suppliers’ strong focus on efficient collection of outstanding invoices, as a way to contain the financial and administrative costs of carrying outstanding trade receivables. Domestic uncollectable receivables were written off as often as foreign ones. Uncollectable domestic B2B receivables originated most often from the chemicals, construction, consumer durables and electronics industries. In line with the regional response rate, 43% of the suppliers surveyed in Taiwan (51% in Asia Pacific) wrote off receivables as uncollectable most often because the customer went bankrupt or out of business. Interestingly, more suppliers in Taiwan (33%) than in Asia Pacific (22%) reported that receivables were written off as uncollectable due to disputes over invoices. This is consistent with earlier comments in this report, and with the fact that notably more suppliers in Taiwan (35%) than in Asia Pacific (25%) said that domestic customers delay payment most often due to disputes over the quality of goods delivered or services provided. Suppliers surveyed in Taiwan reported trading on credit terms mainly with B2B customers in the consumer durables, construction, ICT, food, machines, chemicals and business services industries. Invoice payment terms extended to B2B customers in the chemicals industry appear to be the longest (averaging 42 days from the invoice date) of all those granted in other industries surveyed. Despite being granted above average terms for payment of invoices, B2B customers in the chemicals industry take the longest to pay overdue receivables (on average, within 32 days after the invoice due date). However, it is the construction industry in Taiwan which generated the largest proportion of past due B2B invoices. Around half of the total value of B2B invoices issued by Taiwanese suppliers to B2B customers in this industry was paid late. The lowest proportion of overdue B2B receivables was generated in the electronics and food industries. Based on survey responses, late payment of invoices due to liquidity constraints from customers occurred most often in the chemicals and construction industries (65% of suppliers surveyed in Taiwan cited this in respect to both industries). Late payment in the metals industry in Taiwan was most often due to the formal insolvency of the buyer (according to 64% of the suppliers surveyed in the country). Most of the Taiwanese suppliers surveyed (54%) do not anticipate any change in the payment practices of their B2B customers in the metals industry. An improvement in the payment behaviour of B2B customers in the electronics industry is expected by 53% of Taiwanese suppliers (compared to 16% expecting deterioration). The payment behaviour of B2B customers in the construction industry in Taiwan is also expected to improve by 41% of suppliers surveyed (compared to 36% expecting a deterioration). In contrast, in the chemicals industry, 35% of the suppliers surveyed expect payment practices of B2B customers to worsen over the next 12 months while only 25% anticipate improvement. No significant change is anticipated in respect to payment practices of B2B customers in other industries.